In this Easy Angel Crafts Angel Trio, if one angel is good, a trio of angels should be even better. These three angels cheerfully smile at all who pass them by. 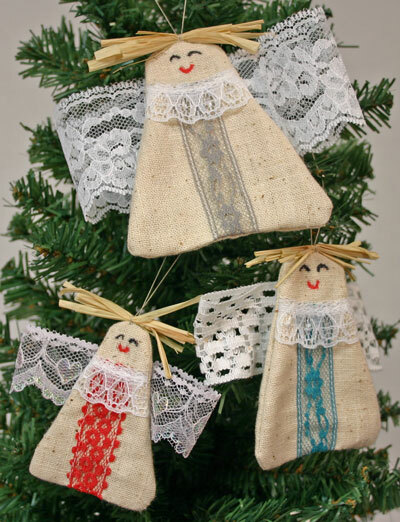 They easily hang on the Christmas tree or where ever an angel or three can be suspended to smile at everyone. 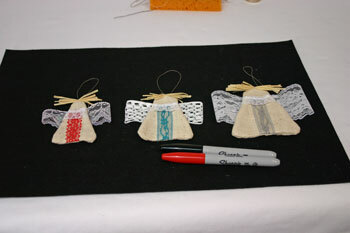 Cut out the angel shapes specified for the Angel Trio from the pattern page. Fold the fabric to have two thicknesses. Pin the three shapes to the folded fabric. Cut the fabric around the edge of each pattern. There should be two pieces of fabric for each shape. 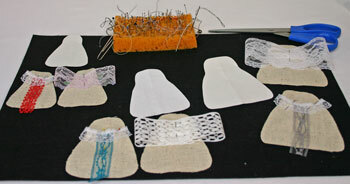 With right sides facing upward, pin the pieces of lace to each fabric angel piece. Each angel's front should have a flat piece of lace from the neck to the bottom edge and a ruffled piece of lace across the neck area overlapping the top end of the flat lace. Fold the wider lace overlapping the ends in the middle of one side. 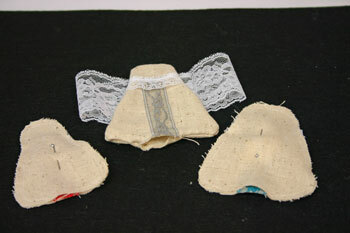 Place the folded lace with the overlapped ends to the back of each angel. The lace should be centered across the shape with the top edge a half inch above the neck area. 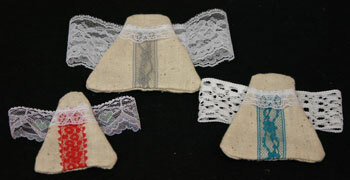 Sew along each side of the flat lace on the front. If using a sewing machine, use 10 to 12 stitches per inch. 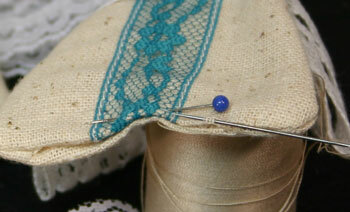 If sewing by hand, use small running stitches. Sew across the top of the ruffled lace at the neck. Leave the bottom of the ruffled lace loose. 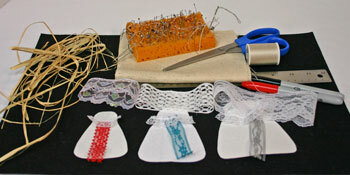 For the lace on the back, sew a line of stitches through the lace down the middle of the back. Trim any excess lace from the edges of the front angel pieces. Fold the lace wings into the center of the back shape. This is to keep the lace from getting caught in the seam connecting the front to the back. Pin the matching pieces with the right sides facing each other. Sew around the sides and top of the shape with a 1/4 inch seam. Leave a small opening in the seam at the bottom to allow the shape to be turned right side out. 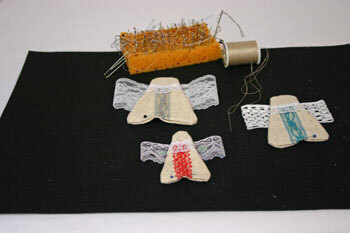 Remove the pins holding the lace wings and turn the Easy Angel Crafts Angel Trio shapes right side out. 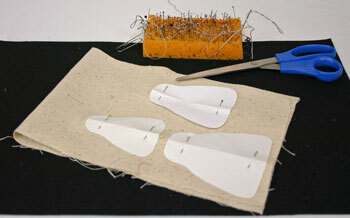 If you want, add a small amount of fiberfill inside each shape for a more rounded trio of angels. In the open area, fold the 1/4 inch seam to the inside on each edge and pin to hold the edges together. 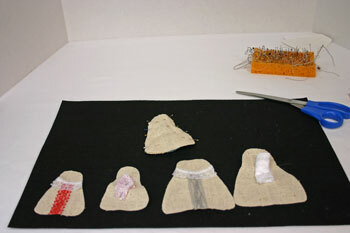 Thread needle with sewing thread and stitch the bottom edges together to finish the seam on each angel shape. The Easy Angel Crafts Angel Trio is almost but not quite finished. 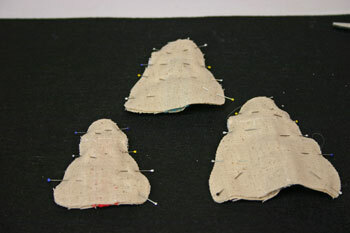 With needle and thread attach the center of the raffia pieces to the center top of the angel shapes. Make sure to sew through all the layers of the raffia to keep the pieces together. 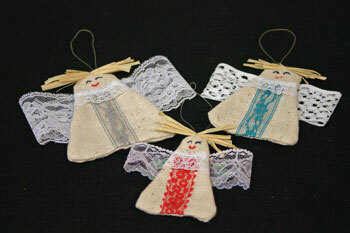 Add a thread loop to the top of each angel in order to hang the Easy Angel Crafts Angel Trio. With paint, pens or pencils, add eyes and a smile to each of the angels. 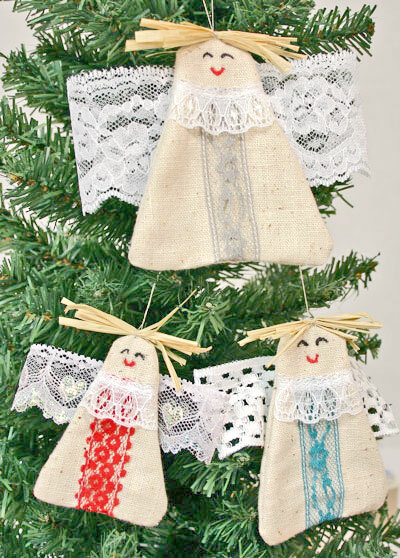 This Easy Angel Crafts Angel Trio happily hangs from the tree. 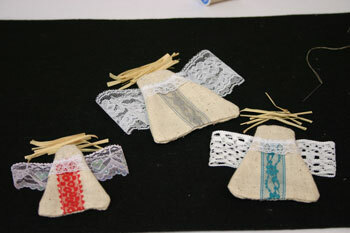 The materials and sewing techniques for the Easy Angel Crafts Angel Trio are simple, easy and inexpensive. With just a little bit of time, you can make a few or many of the angel trios.